Not to be confused with the AlamoDome, San Antonio's Alamo Stadium was a Works Progress Administration project completed in 1940. The facility has been used for a variety of purposes throughout its history, including on three occasions for professional football: by the WFL's San Antonio Wings during their brief existence in 1975, by the San Antonio Riders of the World League of American Football in 1991, and of course by the USFL's San Antonio Gunslingers during their two-year existence. Also known as "The Rock Pile" because of its limestone construction, Alamo became a sore spot for the league. With a seating capacity of under 20,000, the Gunslingers promised temporary seating to allow for closer to 30,000 spectators, still easily the smallest stadium in the league over the final two seasons. Most of the extra seats went unused as the Gunslingers failed to draw over 22,000 fans in any of its 18 home games. 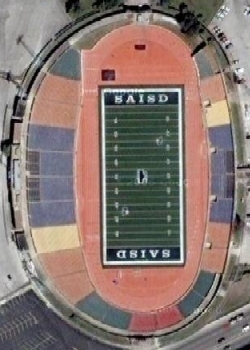 Owned and operated by the San Antonio Independent School District (SAISD), Alamo Stadium today serves as one of the district's athletic facilities. It was added to the National Register of Historic Places in 2011.